It's time to gear up for the school year! 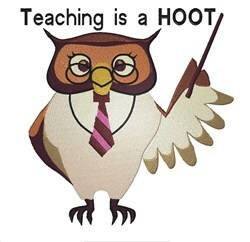 Get this design on framed embroidery, clothing, totes and more for your favorite teacher! King Graphics is happy to present Teaching Is A Hoot machine embroidery design which has 25584 stitches and is [133.60 mm x 134.62 mm] large. If you would like to view more embroidery patterns please search on our embroidery designs page.